Can I make a humble suggestion to you. You are wasting your time trying to have an intelligent discussion with Bro Mikey. You will get more intelligent responses from your pet donkey. Bro Mikey does not have the ability to discern truth from fantasy. If he can think it up then it must be true. Just put him on your ignore list like a lot of us have done and then move on and forget him. I read an interesting article several years ago published by a university where they studied people that were always screwing up because they just couldn't seem to understand when they were wrong. The study found those people had a brain deformation that made it impossible for them to see when they were wrong. We actually had a guy in our department that matched those symptoms exactly. And it appears that Bro Mikey matches also. You will only frustrate yourself trying to reason with Bro Mikey. Reason is something he can not understand. Thanks. I am aware of his condition and I am not frustrated. Again. Another video showing terrible efficiency. Numbers right off his meters. 334 Watts input. 12.6 Volts, 3.9 Amps output for 49 Watts output. Efficiency is 14.7%. Last edited by bistander; 12-01-2015 at 04:07 AM. Here is a low Lenz build. Last edited by BroMikey; 01-26-2016 at 01:34 AM. No, no, no..... if mouse fart says infinite COP it must be so! Last edited by BroMikey; 01-26-2016 at 09:03 AM. Thane's output is 86 volts at 3.9 amps: That's 335 watts or 100% COP! It drops to 12.6V under load (when he connects the yellow clip). The 1 reads as a 7 in the video! You just caught some reflection off the display window. At 2:59 in the video you can see the slight trace of the top of the number 7. The numbers disappear completely from the display window several times due to the reflection. It would make no sense at all to do a comparison video with that huge of a difference. Look at your snapshot: The top of the 1 is missing, along with the cross bar of the 7! The 1 should be visible extended right to the top of the 2. That should place the COP at nearly 75% under load. Not too shabby! Last edited by Allen Burgess; 01-26-2016 at 09:59 PM. Again. Another video showing terrible efficiency. Efficiency is 14.7%. up to 86v after 1400 RPM is reached. come into play verses input. from 1400 RPM to 1700RPM approx. This is where Thane says that the output exceeds the input. The RPM going from 1400 - 1700 has a calculation also. an EV down the road. that the system has not reached the "CRITICAL MINIMUM"
operating frequency where extra energy can enter. Last edited by BroMikey; 01-26-2016 at 10:34 PM. But I just looked at every frame and it is 12.6 not 72.6. You'd think the guy should get a better shot of something like that, don't you? Or maybe a better meter? So BM sees a 1 in that digit but doesn't think there is a decimal point. The top of the 1 is even with the top of the 6 above. The top of the 1 is shorter then the 2 in the other snap shot, enough to conceal the top of the 7! Last edited by Allen Burgess; 01-26-2016 at 11:32 PM. What is the resistance of his coil? And load? yet runs a 1000 watt load. Naturally we all know it just can't be done, right? Last edited by BroMikey; 04-12-2016 at 10:57 PM. Last edited by BroMikey; 04-15-2016 at 08:46 AM. This is the final product, in the generator with looped bifilar coils. It is based on this design and that's clip where they presented it. for motor generator with no outside energy sources. Also transformer energy static generator. This is a very large break thru. Last edited by BroMikey; 04-15-2016 at 07:12 PM. like these right here on this thread. (Odessa, Ukraine) are very smart researchers. Last edited by BroMikey; 04-20-2016 at 05:55 AM. Here is how everyone starts. Developed and produced in small batches motor-generator VEGA, the company DP VERANO in Odessa. 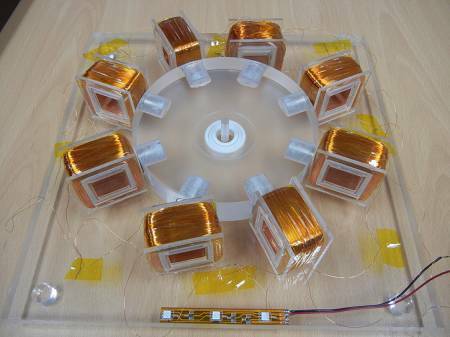 At the heart of the three-phase generator with permanent magnet excitation. By kotormu propeller instead of vertical type, made with the recovery pulse motor coils. feature of the device is that the generator produces 380 volts three-phase. With three-phase generator connected to a three-phase charger that converts 380V to 24V to charge the batteries with removable oganicheniem power. The generator also has features the combined use of to excite the neodymium and ferrite magnets. 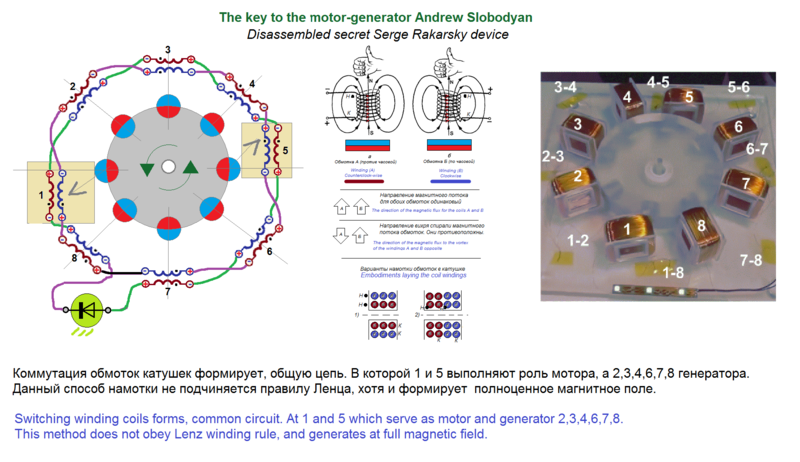 In the Russian-speaking community of seekers of free energy is still tense debate fake it or not. This motor generator it is a prototype, but they have a bigger one working, the concept is original. Last edited by fer123; 04-18-2016 at 12:14 PM. This is generator without breaking force. This is good information for experimentation. Thanks for showing the details. My question would be on the coils layout: you show two winding techniques, one seems to be a bifilar, multilayer and the other shows one coil on one half (and multilayer) and the other coil is shown on the other half part of the bobbin (also multilayer). Is this correct as I understand the layouts from your drawing? Do the two winding layouts give equally good results? Or the bifilar winding may be better? I'll try to explain. For example: Normal bifilyar is wound with two wires, all traditionally pay attention to it. But there are still options. Naprmer coil with two windings, one of which is wound counter-clockwise, and the second while moving clockwise. If we consider a spiral vortex flow EMF from penetrating magnetic flux, they are opposite with respect to coil poles, and have a common direction of rotation (right-hand rule). It turns out that the data reception, we remove the counter induced EMF. The figure below clearly shows, this winding to the secondary winding of the transformer, only the connection - serial. In the case of M-G data Sbodyan are connected by parallel windings, such that represent common circuit. 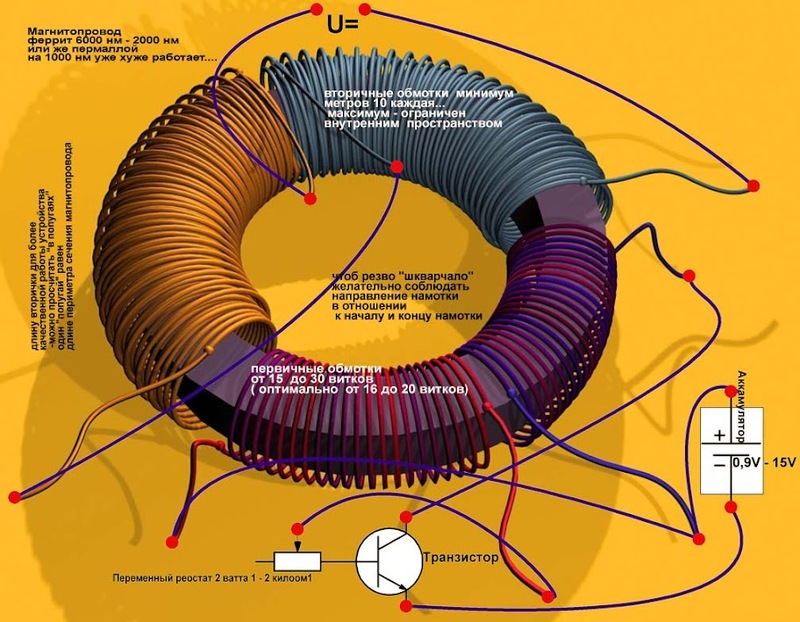 I also drew a black arrow from one of the coils in the picture to the drawing nr 1 to show that its winding layout (and all the 8 coil winding layouts) corresponds to your coil layout nr 1, is this a correct assumption? So these are what I meant with my question, sorry for my mistake to confuse normal bifilar winding with the clockwise and counterclockwise windings. So do I understand the coil embodiments correctly now? or I still confuse something?